Hire A Waltzer Ride, Fabulous Fun. An all time classic funfair ride, the waltzer has been entertaining people for generations. Fast and thrilling, but still suitable for younger kids due to the enclosed cars, this is fitted with state of the art sound and lighting systems to create a true centrepiece for any event. An all time classic funfair ride, the waltzer has been entertaining people for generations. Fast and thrilling, but still suitable for younger kids due to the enclosed cars, this is fitted with state of the art sound and lighting systems to create a true centrepiece for any event. The waltzer consists of a series of cylindrical spinning cars, placed on a large platform, which not only spins but also has a number of hills which as the ride rotates, causes the cars to begin spinning. One of the oldest thrill rides on the fairground, this has been brought bang up to date with the latest sound and L.E.D. 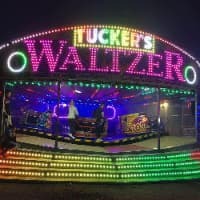 lighting systems to create a stunning modern waltzer. This is like having a mobile disco at your event and provides a fabulous atmospheric experience, suited to almost any age guests. 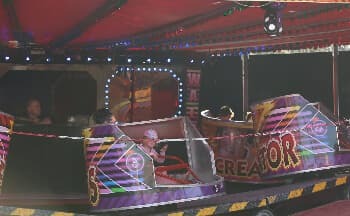 We also offer a mini waltzer, ideal for the youngest generation and a perfect complement at family fun days, special packages are available when hiring both sized rides together. The waltzer was invented around 1920, reputedly by a Mr Dennis Jefferies of Congleton, the first passengers being his nieces, Phyllis and Dolly Booth. Many of the established waltzers were built by the Musselburgh firm of Maxwell and Sons, with 10 passanger cars, although some rides that were converted to waltzers had 9 and 11 cars. To ensure that you and your guests have a fun and most importantly safe experience. Most of these documents are currently legal requirements, if your potential operator cannot supply them then you should walk away, if they are cutting corners here, what else are they neglecting. We can advise on the most suitable combination of attractions to cater for your precise requirements, not just rides, but games, catering and photography services as well. We have experience in organising events of all sizes, from a small private birthday party to a major festival event for a multinational company. Check out our other rides for more ideas. We have experience in organising events of all sizes, from a small private birthday party to a major festival event for a multinational company. Contact us to discuss your requirements. Hire a funfair ferris wheel, available throughout the U.K. and Europe. Including Scotland, London, Lancashire Yorkshire, The North East and The Midlands. Its a perfect addition to any Military ball, college function, wedding, birthday party, exhibition, company event or corporate event or fun day.